We are all pre-conditioned to some degree. That is as we have grown up, our families and friends have all influenced us, we’ve all felt fear, love, embarrassment, shame and many other emotions. But did you process them? Physical Chakras can help you out here. Having an emotion fully processed means that you are no longer affected by the emotion, that you have learned, understood and can freely move forward unaffected by it in your life. (This doesn’t make you cold, it makes you compassionate, if you feel coldly unaffected, it has not been fully processed). If you have ever felt humiliation standing in front of a group of people, and find yourself still afraid of group situations, the original emotion wasn’t fully processed. If your parents never showed you affection, you may find yourself craving it as an adult and yet still unable to find it; the original emotion hasn’t been fully processed. If you have ever felt that people always seem to let you down, make you angry or put you down. These are all directly related to emotions which have not been fully processed. Understanding how our emotions are not always fully processed can assist in understanding how the chakras then cause physical imbalances. 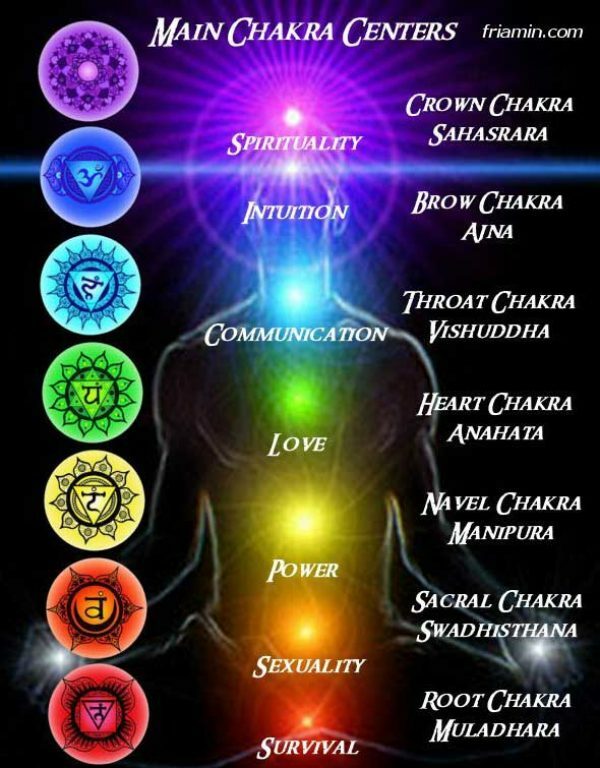 Our energy, our life force flows through our physical chakras. If we cling on to an unresolved or unprocessed emotion, what happens is less energy can flow through our bodies. Our life force is restricted. If you can imagine your life force as water flowing through pipes. In areas where there are stored up emotions, liken them to debris and waste in those pipes causing blockages which limit the flow. Debris in pipes caused festering and decay. Likewise when our life force can not flow freely through us; it manifests physically. If no energy can flow where energy is needed, things don’t work properly. Basically, when we do not fully express and process our emotions, we are storing things up inside us. Our chakras then enforce our bodies to deal with it. Let’s call it overflow. The pressure in the pipes builds up and effects the surrounding areas. That which you do not deal with emotionally will get dealt with physically. As you become more aware of your emotional/physical link, you will find that your body gives you easier symptoms rather than a huge illness. You’ll start to note every little twinge and hopefully, choose to deal with immediately. If you are suffering from a serious ailment; the chances are this has been forming for a long time. The more serious the condition; the further back the emotional conditioning was formed. For example: If you get a tension headache, it is formed quite quickly. Likewise are aching shoulders. Sporadic pain, as in a flash of pain which comes and goes; serves more as a warning. Regular sporadic pain and irregular sporadic pain serve as things which are recent. The ache, pain or tension won’t immediately manifest in seconds; generally, though it will manifest physically after a period of repression. For example; if you are nervous before a meeting, you may start feeling more and more nervous the closer it gets, thus it weakens your bladder and you find yourself running to the loo every 15 minutes. However, once the meeting is underway or over, that need disappears. Ongoing illness, things which have lasted months or years, will have formed long before the start or diagnosis of the illness. We receive small reminders if they are ignored; they build up.